The event “Foodways and fisticuffs: the larger than life personalities who shaped Quebec cuisine” was an evening of storytelling. 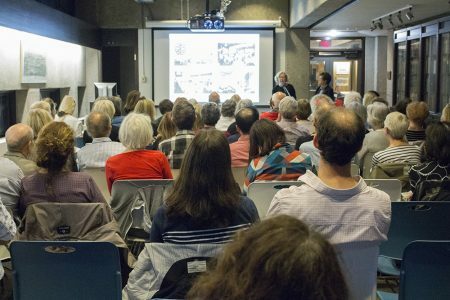 Speakers Nathalie Cooke and Julian Armstrong led an intimate, informative, and above all entertaining talk in the first of this year’s series of presentations organized by the Friends of the McGill Library on October 4, with an encore presentation on October 11. 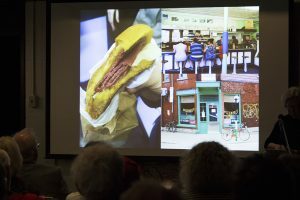 The lecture explored the cultural significance of food, sitting at the intersection of history, geography, and function. 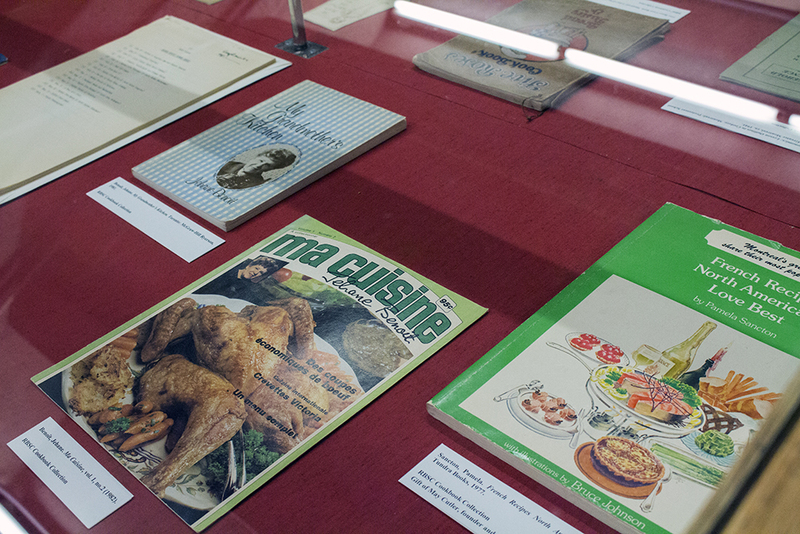 It also highlighted the passionate defense of regional food varieties, whether tortière, pea soup, or maple pie, as local heritage. 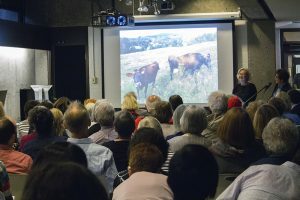 Julian Armstrong and Nathalie Cooke told tales of larger than life Quebec characters, such as Joe Beef, known both for his generosity and for the bears he kept in the pit of his house. The 19th century Montreal tavern owner welcomed customers of all backgrounds, and kept couches for those who overindulged or who didn’t have a bed for the night. He also helped deescalate the 1878 conflict on the Lachine canal by breaking bread with both strikers and soldiers. Amy the cow figured in another story, as the modern, quite photogenic descendent of a herd shipped from France to Quebec 1608. Known for their hardiness in the Canadian winter and the cheese made from their milk, La vache canadienne is now making a comeback after its displacement by British Holsteins. The speakers discussed the heritage of many of today’s foods, recipes, producers and culinary ground breakers, many of which the audience members could recognize as a community. The convent on Sherbrooke Street, for instance, had a cooking school run by nuns, where many Montreal women learned to cook early in their married lives. These included Julian, known for her cookbooks and 50 years spent writing about food for the Montreal Gazette and the Montreal Star. Nathalie is also prominent as both a McGill Professor and the Associate Dean of the Library’s ROAAr unit (Rare and Special Collections, Osler, Art and Archives). Fittingly, the event was held in the historic Colgate Room of McGill’s Rare Books and Special Collections Library. The venue was newly opened following renovation, thanks to a generous donation by the Joan and Clifford Hatch Family Foundation. Further renovation is planned for the McLennan/Redpath Library Complex. McGill’s Canada150/Montreal 375 hosted a wine and cheese to end the evening.